Sometimes the stories represented by the photos of small details are those that only you or those close to you might know. We got married at Nanga Gnulle gardens in Bendigo. Being in front of the camera isn't my favourite place to be so my Uncle took our photos and they were relaxed and casual, exactly the way I hoped they would be. This is one of my favourites. Soft focus, a little dreamy, capturing the exact moment everything is official. The story behind it? There are a few. You can just see the edge of the plaster on our Pastor's arm. He got that from a skate-boarding accident the day before the wedding. Yup, skate-boarding. His nickname on the day was "Pastor in Plaster." My nails have never looked that perfect in my life, and probably never will again. My sister gave me a french manicure the night before whilst we were watching "Forces of Nature" on DVD. Nothing like a Sandra Bullock movie the night before the big day to calm your nerves?! Anyway, like I said, it's the little things & the stories behind them that often count just as much (if not more) than the big things. I've got Wedding & Entertaining/Events boards going over at Pinterest if you're interested in following. And if you're looking for wedding inspiration, there are so many stunning blogs out there, but how can you go past Style Me Pretty. 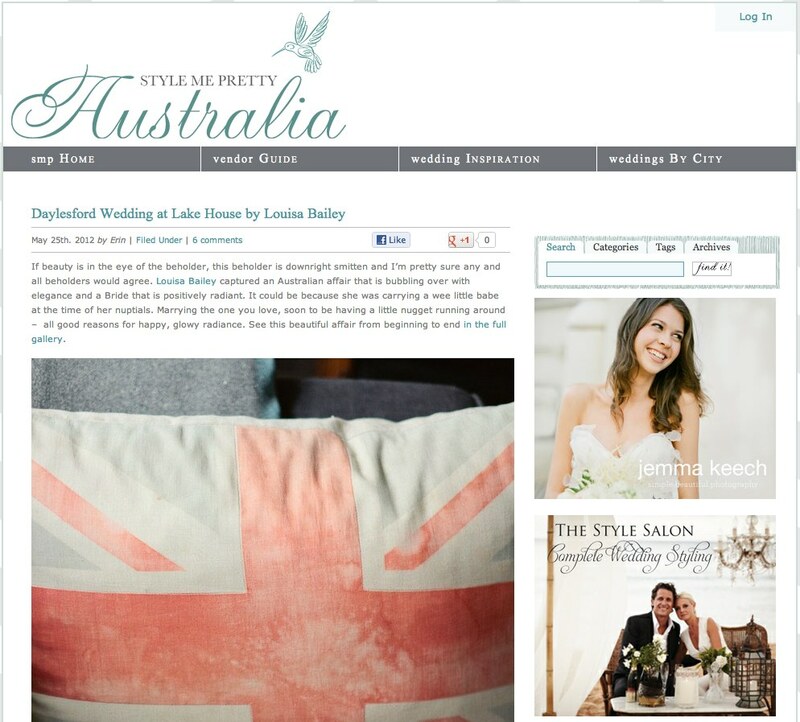 They even have a section devoted to Australian Weddings. And, coincidentally, they have a feature on Jeremy & Elsie's wedding (photography by Arrow & Apple) also. Check out this amazing & individual wedding video by Goodwin Films for Elsie & Jeremy Larson. I could devote a whole post to Elsie, she's one of my favourite bloggers/artists/vintage designers. Do you have any stories about small details captured during the big moments?